My guest on this episode of the Spirit of Magic podcast is legendary close-up and bar magician JC Wagner. We cover everything from his days working the Disney Magic shop with Steve Martin to his time working the bar with Bob Sheets and Doc Eason. JC also shares some of history with Dai Vernon, Eddie Fecter and other legends of the west coast magic scene. 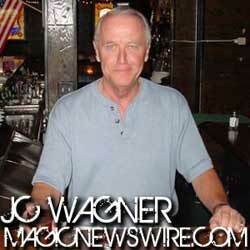 If you want to work magic in the bar, there is no better teacher to learn from than the amazing JC Wagner. Many of you will know that JC is currently undergoing treatment for colon cancer. He talks about the status of this after having just returned from a run at the Magic Castle. HINT: He's feeling great!